I just had the pleasure of finishing up the first 3 books of the Farlaine the Goblin series – Book 1: The Tinklands, Book 2: The Saltlands, and Book 3: The Racelands. As I was reading along, completely enjoying every page, one word kept popping up in my head: Dazzling! This series encompasses everything that is fun and enjoyable about the comic book medium. 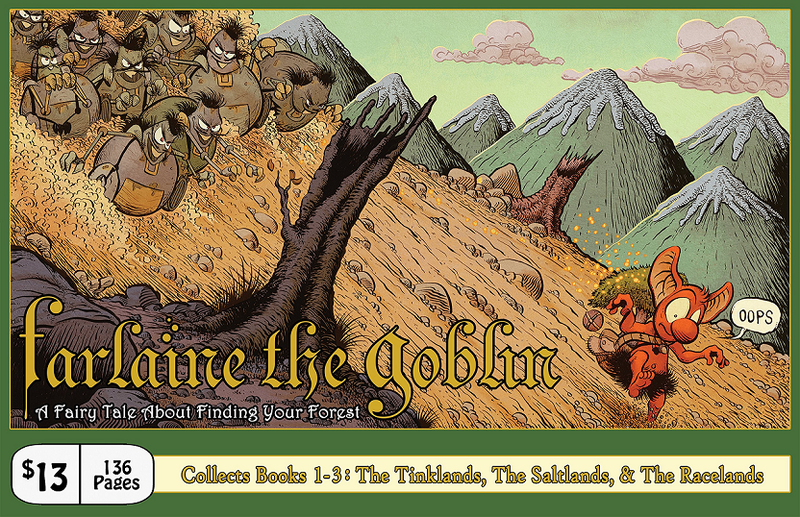 A story of adventure, laughs, and magical fun, Farlaine the Goblin is one of those rare books that everyone should be reading because it offers something for the lighthearted in all of us. The book follows a small tree Goblin named Farlaine who is searching for a forest to call his own. Along the way he encounters a variety of characters who help, and sometimes hinder, his search. Farlaine travels with a magical “pet” tree named Ehrenwort and that only adds to the charm of the book. While the story is engaging for all-ages, the art makes this book standout above and beyond others. A crisp, clean style that brings to life a magical land filled with dazzling (there’s that word again!) creatures. Each page is layered with detail that’s meant to be discovered and appreciated. A true delight to the eye. I won’t do the book a disservice by comparing to anything else on the stands because it easily stands out on its own. This book perfect to introduce kids to what comic books offer or for the seasoned reader who needs a reminder of how fun comic books can be. Do yourself a favor and find this book. Read it and then pass it on to a friend. I’ll be continuing on with Book 4: The Twistlands. 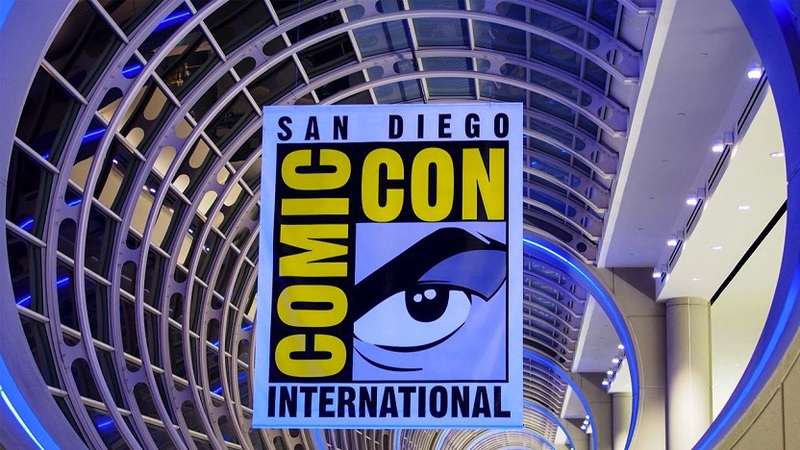 Fans of Hellboy are well aware of the B.P.R.D.. The organization has proven so popular that it’s received it’s own series. For those who aren’t hip, the Bureau for Paranormal Research and Defense (the B.P.R.D. or BPRD) exists in the Hellboy universe and comes from the mind of Mike Mignola. The organization was founded by the United States and United Kingdom governments, charged with researching the occult, paranormal and supernatural, and defending against their dangers. <iThe Devil You Know is the final cycle of the ongoing B.P.R.D. stories, continuing on from where the Hell on Earth cycle left off. It also has a new co-writer, Scott Allie, following the departure of John Arcudi. The story is complimented by artist Laurence Campbell, best known for his work in 2000 AD and previous B.P.R.D. stories. He gives the stories proper mood and his style meshes well with the story. This was an easy issue to review. If you’re a fan of BPRD and/or Hellboy, you’ll really enjoy it. 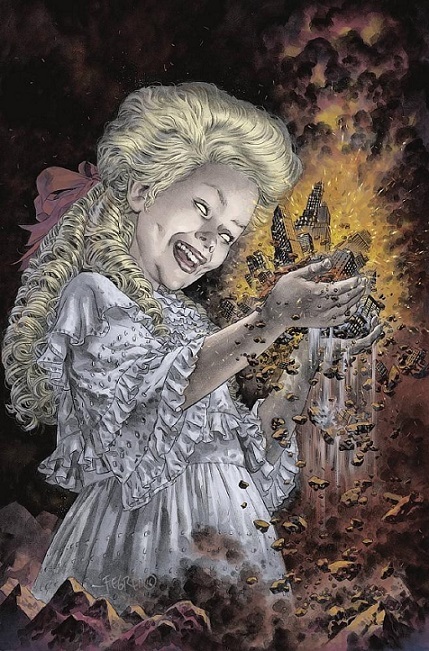 It hits all the marks of what makes a good BPRD story. New fans might be a little lost but it’s still an entertaining read and Mignola does his usual solid job of laying things out for the reader but never over-explaining or over-doing it. BPRD has long established itself as a must read for fans of the supernatural and The Devil You Know gives the reader plenty to chew on. Broken pacts in hell lead to multiple demons struggling to crossover over to our world with BRPD fighting to save our existence. We follow different factions from the Bureau as they piece together ways to stop the demons, each part creating tension and building to a greater whole. The Devil You Know kicks off another bold and dramatic chapter and is a great read for fans and best enjoyed during a rainy night with plenty of lightning in the background. 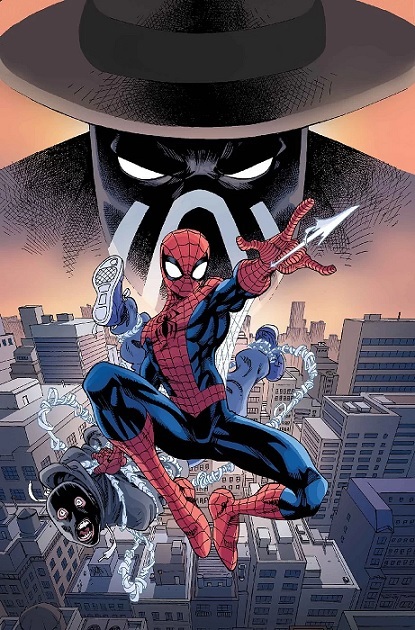 The team that brings you the SPIDEY series returns with a one-shot featuring an old school Spider-Man tale with the first appearance of the Vulture thrown in for good measure. It’s short on plot but long on art which makes for an uneven experience. I’m not sure what Robbie Thompson, Jim Campbell, and Nathan Stockman were hoping to accomplish when the crafted Spider-Man: Master Plan. It’s a throwback to the earlier days of Spidey, when his only concerns were keeping Aunt May happy and fighting street crimes. And their choice of super villain is odd as well. The Crime Master? That’s digging deep into Spider lore. Don’t get me wrong; it’s a quick and fun read, but it’s hardly necessary reading. Like I previously stated this is a fun little issue and the art is the main reason. Stockman channels his inner Ditko with some Humberto Ramos thrown in and the result is some fantastic visuals. Campbell’s coloring is vibrant and bold. When it’s all said and done Spider-Man: Master Plan is low on plot but high in art. The inclusion of the ASM #2 reprint took up some of the real estate that the main story could have used. While I do understand that decision I think it hurt the main story. 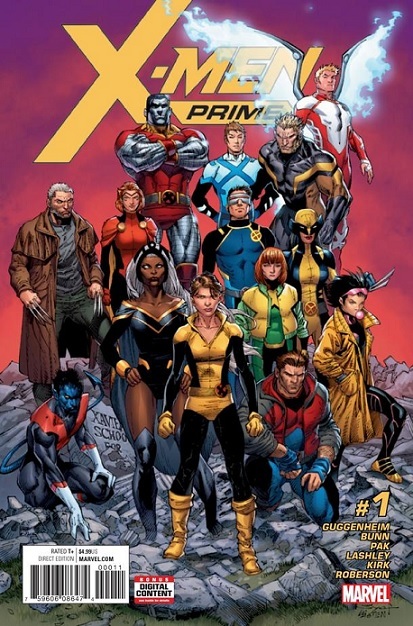 As far as X-Men goes, Prime has fallen short of my expectations. At least this issue. It was all setup, no meat or plot really whatsoever. The big reveal at the end was merely the new location of the school. This story has potential, so I may read a couple issues more, but so far I’m not very impressed. I enjoyed Blue and Jean Grey’s #1’s much more. The art was a team effort done by four people. Maybe that is why I’m having trouble getting into it. It feels rushed, choppy, and overall, not all that pleasant to look at. The colors were done by three colorists and they didn’t redeem the art much at all. Usually if I don’t enjoy a story, I can get by with looking at the awesome artwork. Unfortunately, this is an exception. I want to like this book, I like all of the characters, I want this book to succeed, but I’m not seeing that for this issue and I hope I’m wrong. Overall, this issue had almost no plot, almost all setup. I expected it to be a “setup issue” but maybe a 60-40 split between plot and setup. This issue felt more like 10-90. It is sad because the X-Men titles are some of the better stories coming out of Marvel right now, and this title seems like such a step backwards. I hope it gets better in the next couple of issues, but for now I’m not expecting much. Secret Empire has been a mixed bag. The action is great, dialogue have been interesting, the story and world-building has been there, but the way Spencer has decided to present the story, it had become weary or tiring and seemed like it was just building up to a moment, which never came. We can safely assume that the final act of the story should start in the next issue and things are about to finally get interesting. As every issue, readers are given a status check on all the other fronts our heroes are fighting. There is the streets of New York with the heroes working to get NYC out of its dark dome and we even have appearances from Dr.Strange and Daredevil. Meanwhile, the Black Widow is still plotting to kill Supreme Leader Steve Rodgers. As of this issue, curious readers will also get answers to the lingering questions about where the ‘other’ Steve is or what is happening in those mysterious scenes. As of last issue, Hydra has attacked the rebel base. Also, Mockingbird was not the traitor to lead this attack but a surprising fellow. We even have a throwback to Civil War, with Steve and Tony Stark. 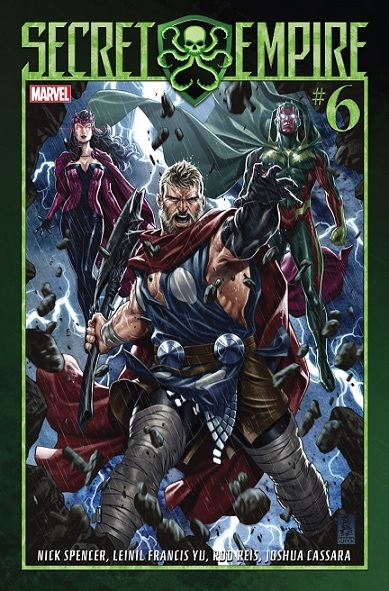 The heroes are reluctant to fight their former partners and the way they have presented the Hawkeye or Thor (Odinson) or big green monster Hulk is a great way to tell the fans/readers that these are/were supposed to be heroes. The exchange between Steve and Tony was good and worth checking out. The issue closes out in a mysterious way as well as hinting to the final act in the story. The art team has been fantastic. Spencer has continued to play with political beliefs and has laid it barren in this issue. Maybe Secret Empire will have a glorious end and all our questions will be answered but how long should readers wait? Steve here! That’s all the time we have. Tell us what you’re reading below and see you back here next week! Youcan now find our reviews on ComicBookRoundUp.com!